to products and services within SLAs and critical process RTOs. 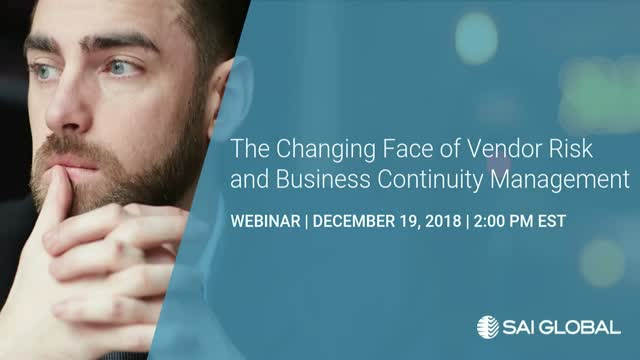 Join us on Wednesday, December 19 at 2:00pm EST when Terrance Lee, VP Strategic BCP will address these current realities. Some folks very successfully use “the dark side of the force” to further InfoSec practices as ethical hackers. Vinny Troia, Joshua Crumbaugh and Alex Heid. Over the next couple of weeks we’re going to introduce you to our high-profile digital investigators, tell you some of their mind-bending stories and show you why you should carve out time in your calendar for this event. Their stories are going to reveal what it’s like behind “Darth Vader’s mask”--an exclusive peek inside the mind of an ethical hacker. The webinar will go live on May 9 at 2 pm EDT. Take action now to register. Only you could be so bold. The meaning of those words is broad. And means something different to different IT Security folks. But there’s one common thread: taking a business-first approach to technology risk. If this is something you’re struggling with, we’d like to have you join us for a live webinar on April 30 at 2:00pm EDT with Norman Marks leading the discussion. Technology risk must be an ongoing business conversation. Are you in? Are you continuously refining many of your business processes and procedures just to get your job done? What if there was an easier way to retool some of those broken methods and land on processes that make better sense? If you’re thinking that your business processes and procedures are ineffective or need improvement, take a moment to register for this enlightening presentation. You just might get by without the shiny object. Amid the common definition of the phrase ‘risk appetite’, GRC trailblazer Norman Marks, debunks its conventional meaning during a live talk on Tuesday, March 26, 2019 at 2:00pm EDT. Marks will bring you a fresh perspective on recognizing that no organization will succeed if it doesn’t take a risk. So let’s stop talking about managing and mitigating risk. Let’s talk about what might happen. Think blue skies…if you could select your supervisor, who would you it be? Your CEO, CTO, CIO? On a live session, March 13 at 2:00pm EST, accomplished veteran CISO, Todd Fitzgerald, will help you understand how your role as an InfoSec practitioner is viewed within your organization based on who you report to. By the way, your horoscope for today is to register for this intriguing conversation. Have you noticed that the cost and scope of the SOX compliance program keeps multiplying? What’s up with that? Our leading GRC authority, Norman Marks, will explore the causes of this emerging trend and more during a live talk on Tuesday, February 6, 2019 at 2:00pm EST. Marks’ risk-based, top-down approach to SOX compliance just might surprise you enough to take action. Remember when there was a lot of ruckus about robots taking over people’s jobs? There’s no immediate cause for you to worry about that, but we do know there’s a widespread concern over the shortage of qualified InfoSec talent, especially in the healthcare industry. We have a solution that we think can help. We’ve teamed up with Meditology Services LLC, a professional services company with an exclusive focus on healthcare IT, to bring you a panel of expert InfoSec practitioners on a live webinar February 6 at 2pm EST. This user group will talk about everything from Digital Risk automation tools to hiring and recruiting the best talent. Start your own trend…register now for this timely conversation. What’s your strategy for protecting your network systems? Whether you’ve just redefined your cyber strategy, rethinking your approach or needing to develop a program, tune in for the 2nd live webinar in our CISO Leadership Series with Todd Fitzgerald, veteran CISO, January 30 at 2:00pm EST. Fitzgerald will talk through the 7S diagnostic model involving strategy, structure, systems, staff, skills, style and shared values. The 7S Framework is mainly used to trace performance problems in an organization for the purpose of changing or improving these areas. Only increased awareness and education can strengthen your cyber program. If you’re thinking that your information security approach is insufficient or needs improvement, take a moment to register for this instructional presentation. Norman Marks may not have coined the term, Governance, Risk and Compliance—but he’s one heck of a GRC giant. During a live chat on Tuesday, January 22, 2019 at 2:00pm EST, Marks will share his wisdom, what makes him tick, why he’s been so successful, what failures he’s had to overcome and his forecast on the future of GRC. Sneak peek! One of the quirky questions we’ll be asking Marks is: if you were given a 30-second ad slot promoting IRM (no products) during the Super Bowl, what would it say? Find out if Marks is optimistic about the future of IRM. It’ll be a smart start to the new year. The financial services industry is increasingly impacted with new regulations, as well as the growing risk from hacktivists, nation states, and other cyber criminals. As the types of cyber threats rapidly grow and change, cybersecurity regulations are trying to keep up. Join our live webinar with Paul Ferrillo, Attorney and Shareholder with Greenberg, Traurig LLP as he reviews the changing regulatory landscape and offers insights on how to address it. SAI Global is pleased to announce a new partnership with Todd Fitzgerald, Managing Director and CISO, CISO Spotlight, LLC. Together, we're launching a new CISO Leadership series that will help you become a better leader. Our first live webinar in this series covers the modern Chief Information Security Officer's role and how it's evolved significantly over the past 25 years. The CISO is on the front lines, keeping up with new emerging technologies, and presenting to the board. But how do we know the CISO is effectively addressing all the necessary cybersecurity areas to be effective organizationally? Is the strategy correct? Is the structure of the organization set up for success? Are the right staff and skills present and is the CISO communicating effectively with the board? Is there a capability we are missing? This leadership session takes a holistic view of the business of being a CISO to protect the information assets of the organization. Traditional approaches to technology risk lead to assessing it as 'high', 'medium or 'low'. But how do you know whether it makes business sense to take the risk or invest scarce resources into addressing it? Is it better to spend money on people and tools to mitigate cyber risk or to invest in a new product or marketing campaign? You know this better than anyone working in IT security at a healthcare organization. One of the top vulnerabilities that continue to plague hospitals is cyberattacks, many of which are caused by doing business with third-party vendors. You’ve got a tight budget, limited resources and a painful path to get the physicians and board to prioritize IT security, but we’re here to help. We’ve teamed up with Meditology Services, a professional services company with an exclusive focus on healthcare IT, on a live webinar October 31, 2018 at 1:00pm EDT. Through data and analytics, Brian Selfridge, a Partner at Meditology Services & CORL Technologies, will address the ways you can improve your current risk practices and relationships with providers. What do we mean by risk in the extended enterprise? And how do we identify and then assess these risks? Our monthly in-depth conversation with Marks continues on a live webinar, October 23 at 2:00pm EDT. As a lifetime risk practitioner, Marks will discuss the specific use case of third-party management and the implications for risk decision-making across the extended enterprise. It’s likely you’ve been wondering if you’ve got the right vendor risk management program in place. The fact is if your vendors breached your company data, you’re liable, and your program is lethal. Many factors go into understanding the risk of doing business with your vendors—where will your company’s data be physically located and how access to it will be managed, what’s in your vendor’s previous audits and what does their cyber strategy look like. But one thing is certain: When your vendors are at risk, your business is at risk, impacting your entire organization’s ecosystem along with long-lasting legal consequences. Over the next few months, we’ll be taking a fresh perspective on vendor risk management that’s perfectly geared for you wherever you are in the VRM lifecycle. Our first event is a game-changer. A live webinar on Wednesday, October 10 at 2:00pm EDT featuring Jim DeGraw, a partner in Ropes & Gray’s corporate technology group. DeGraw regularly provides data incident crisis management counseling, leads investigations into potential data breach events, advises clients on establishing and conducting assessments of information security and data handling governance programs. DeGraw will walk you through the disruption and evolution of VRM: regulatory, demographic, technological, current events, and the role digital and the global economy play in these vendor risk changes. Find out how you can thrive when your vendors aren’t. How are you measuring the effectiveness of your risk management program? Assessment strategies over the past few years have become increasingly more sophisticated, information-intensive and complex. Norman Marks makes it straightforward. Our monthly educational discussion series continues with Norman Marks on Tuesday, September 25 at 2:00pm EDT. Marks will dive into the specifics of setting the right strategies and objectives to deliver value considering what might happen (risk), understanding how the achievement of objectives may be affected by events and situations as management and staff execute those strategies, and much more. Make and bold move and grab your seat today. Straightforward is a good tale to hear. The requirement that a driver shall “give way” to other vehicles means that he must not continue or resume his advance or maneuver if by so doing he might compel the drivers of other vehicles to change the direction or speed of their vehicle abruptly. Individuals are left to their own interpretation of this definition, from performing a prolonged stop to accelerating at the sign. Enforcement is difficult. And so it is with the numerous ways that Compliance and Risk must coordinate and collaborate within your organization. Norman Marks is a firm believer in taking a risk management approach to the business objective of operating in compliance with both laws and regulations and society’s expectations, even when they aren’t reflected in laws and regulations. Share your thoughts with Marks on a live webinar, August 14 at 2:00pm EDT when he’ll discuss his point of view about the practical application of the concept of risk appetite and its impact on influencing the day-to-day taking of risk. You’re about to experience the ultimate guide to communicating risk. Wisk away your biases (admit it… we all have them), forego over-complicated explanations and sidestep the temptation to email risk-related issues to your colleagues. You’ll discover how you can intelligently improve your thinking about risk and communicating risk concerns from a science-based risk communication model on a live webcast July 18 at 2:00pm EDT. Timothy Sellnow, Ph.D. and Deanna Sellnow, Ph.D., are Professors at the University of Central Florida, Nicholson School of Communication, whose primary research and teaching focuses on strategic communication for risk management and mitigation. Tim and Deanna will share with you their best practice framework model for effective instructional risk and crisis communication during this informational session. Stake your claim to the ultimate guide. Despite risk’s wretched reputation, you’ll be glad you did. Nobody likes to talk about it. It makes people feel…uncomfortable. I’m talking about the human side of risk. The way we think, act on and communicate about risk, plays a major part on how we would manage a cyber breach for instance. Consider Facebook, Equifax, Target, Uber and so on. And no one is better positioned to influence the outcomes on security and risk management than you. We’re not talking about making a sweeping cultural change enterprise-wide. You can make a slight change in your thinking about risk that just might help you avoid your next data breach or better communicate a phishing scam. Our first in a webinar series tackles the mindset that all of us inherently possess around risk and its impact on information security issues. The workshop kicks off on June 25 at 2pm EDT featuring Hersh Shefrin, one of the pioneers of behavioral finance. Shefrin holds the Mario L. Belotti Chair in the Department of Finance at the Leavey School of Business at Santa Clara University and has published scholarly articles in the Journal of Finance, Journal of Financial Economics and Review of Financial Studies. Don’t worry…you don’t have to slip into your Birkenstock’s for this. Just sign up and listen. The SAI Global channel features presentations with Integrated Risk Management thought leaders, customers, analysts and leading solution experts. Our IRM solutions are a combination of leading capabilities, services and advisory offerings that operate across the entire risk lifecycle allowing businesses to focus elsewhere. Together, these tools and knowledge enable clients to develop a holistic, integrated view of risk.